We’ve seen a lot of robots able to walk over the last decade or two, but most of these bots have seemed, well, a little clumsy. 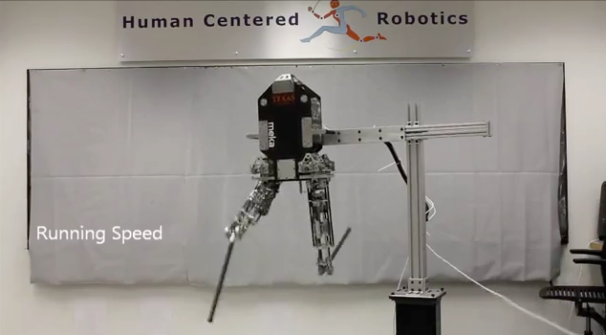 Enter Hume, a new robot that promises “Human-Centered Hyper-Agility.” For non-roboticists in the audience, that means Hume will be able to run at high speeds over rough, uneven terrain on two legs, much like how we humans move. Hume is a project of San Francisco based robotics company Meka Robotics and the Human Centered Robotics Group at the University of Texas at Austin. The team ecently published a paper on the project (PDF), along with a video that gives you an idea of Hume’s current capabilities. As you can see from the video, the team still has some work to do before Hume is ready to start running through the streets of your city. Hume’s makers have constructed a working prototype. but they’re still working on the software to let Hume run at human speeds over the irregular terrain they’ve constructed. At the moment, Hume is mechanically capable of runnning at high speeds, but still needs assistance to keep its ballance. Hopefully we’ll see him performing some sweet stunts sooner rather than later.